With the advent of the internet, things have come to happen a lot more easily to our generation than they used to do in the slow, sweet, old days. Things aforementioned are inclusive of money as they are of everything else. Making money online is easy if you can boast of a useful skill and can cash it enough to be of some value to other people and yourself. All you need to do is be persistent and not give up easily and the way to making money becomes a lot less rocky. You could know any skill that rings with the buyers and you are all set. Today, we talk about the ways to make money as an Illustrator. Illustration is one such skill very much in demand in the creative market right now. Chances are bright and you can easily pay your rent working as a full-time illustrator. Things become a lot easier with a few years of experience in your arsenal, but even if you are a beginner and thinking of going online with your art to get big on bucks, you can sell illustrations online and get acknowledged and paid well for your work given what you are producing is really of quality and adds some value to the market. If only you are bent on creating your own brand name and establishing your repute as an illustrator, there are plenty of platforms that feature work from budding as well as established artists. Here, buyers interested to buy illustration online can make purchase easily. Sites like ShowFlipper that sell illustrations online are constantly looking for new and rising artists. They look for artists who are potent of producing something new and innovative apart from the beat illustrations that the market is already awash with. You can get in touch with these e-stores and sell your illustrations online once you feel confident enough to put your work up for sale. But before you can develop enough confidence, you would need to work on a few things. If you are starting your career as an illustrator, here’s your guide to make money as an illustrator. We walk you through the things that any budding artist must know to step into real competition with pros. Once you are out into the real world competition and are expecting to be paid for your work, you can’t afford to look or act like an amateur. You have to be absolutely sure of what you are doing. You need to be very sharp on the basics of the art of illustrations, the fundamental rudiments of color compositions, patterns, shapes, and gradients. Not only should you be proficient with the use of online tools and illustration applications, but you should also have a good aesthetic sense of things. It’s important that you develop your imagination and visualization of things. You need to look at 2-D objects and then make a map of them in 3-D to add the effect to the graphics designed by you. You can always learn new things from the myriad tutorials available online and enhance your knowledge. The only way to beat the competition or even survive in it is to keep evolving through constant learning. Treat the art of illustration as a subject and pursue its study until you are completely sure of your knowledge. And never stop learning. Even if you are a seasoned artist, there is always a scope for improvement. Brush up your pre-existent skills while continuing to work on the new ones. Every new thing you come across put it in practice and see how it turns out for you. Theory is of no use if not executed properly. Evolve your own style. Experiment with new concepts and patterns. Nobody will be willing to pay you for something that they are already getting from a name of repute. You need to make an authentic trademark of your own by acquiring a signature fashion of your own. Separate your work from that of others. Discover how you can do things differently. Observe the work of other artists and try polishing your illustrations in a way that is entirely new to the market. When your work speaks of a different style, you will be more visible to people looking for something innovative and offbeat. It might give you a good chance to get in the eyes of potential clients and buyers. But getting visible just does not happen. After having had your work stand out from the others, start sharing it on online platforms. Get in touch with the various e-stores that sell illustration online and offer to feature your work in their illustration gallery. Once you have negotiated your terms with these online agents, you can start to feature on them as an upcoming artist. When you have your portfolio featured across online sites, you can start featuring your illustrations for sale directly on these sites. Some of these sites or e-stores let the buyers even interact with you personally. You can also start to freelance for interested buyers and strike your deals directly with them. Once you have established your name and repute in the market, there’s no limit on how much you could be earning through designing illustrations. All you need to do is persistently be good at your job as an illustrator and keep adapting to changing trends. So go ahead and earn your first bucks as an illustrator. 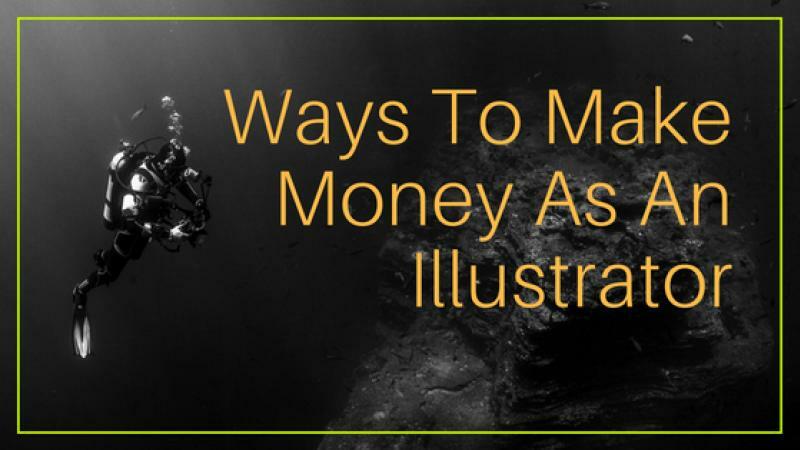 I really hope these Ways To Make Money As An Illustrator helped you. Good luck! Want to showcase your work online? Register with Showflipper to sell illustration online and stand a chance to win cash by participating in Showflipper\'s Mega Contest for Artists.